"Nothing can stand in the face of this…" Universal has released a full-length third official trailer for sci-fi adaptation Mortal Engines, based on a popular book series. This movie has been in the works for years, in development by Peter Jackson and the LOTR/Hobbit team. We've already featured two good trailers for this so far, with this one being the pay off, big time, final push. And it looks seriously epic The fantastically eccentric cast includes Hugo Weaving, Hera Hilmar, Robert Sheehan, Jihae, Ronan Raftery, Leila George, Patrick Malahide, and Stephen Lang. The detailed VFX shots from Weta are looking better and better. The plot in this, which still reminds me a bit of Dune, is about huge cities that move around and battle against each other and a woman who threatens everything. This looks, and sounds, like a mix between John Carter and Transformers or something like that. And I'm still curious to give it a look this December. You can still watch the first teaser trailer for Mortal Engines here, or the impressive full-length trailer here. Thousands of years after civilization was destroyed by a cataclysmic event, humankind has adapted and a new way of living has evolved. Gigantic moving cities now roam the Earth, ruthlessly preying upon smaller traction towns. Tom Natsworthy (Robert Sheehan)—who hails from a Lower Tier of the great traction city of London—finds himself fighting for his own survival after he encounters the dangerous fugitive Hester Shaw (Hera Hilmar). Two opposites, whose paths should never have crossed, forge an unlikely alliance that is destined to change the course of the future. 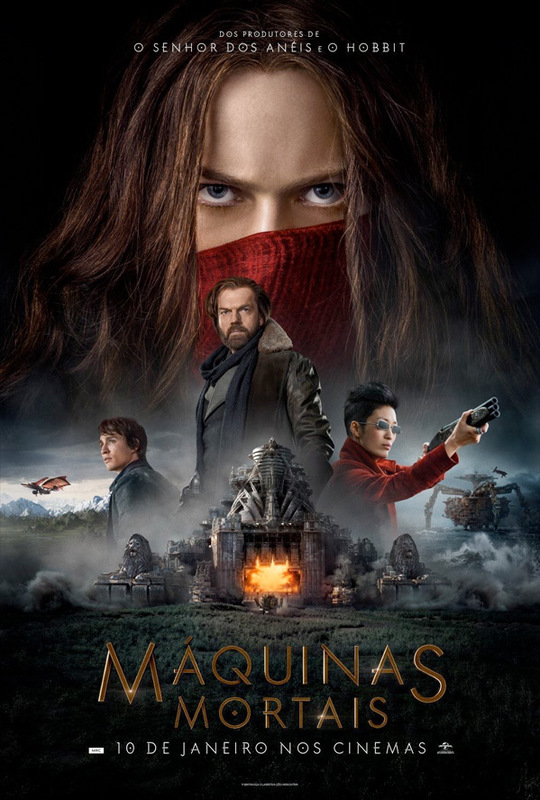 Mortal Engines is directed by Kiwi filmmaker Christian Rivers, a former VFX supervisor and storyboard artist from Weta now making his feature directorial debut. The screenplay is written by Fran Walsh, Philippa Boyens, and Peter Jackson (of The Hobbit, Lord of the Rings) adapted from Philip Reeve's book series of the same name. Universal will release Mortal Engines in theaters everywhere starting on December 14th later this year. Your thoughts?